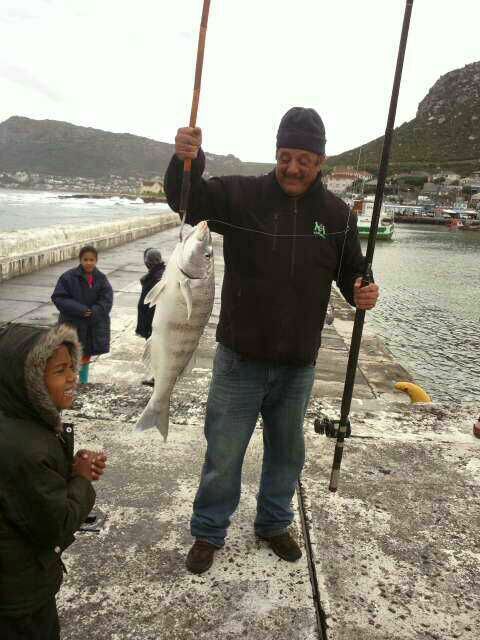 John caught this Steenbras off Kalk Bay Harbour on the 28 September 2013. 74cm and about 7kgs. Fortunately fellow fishermen had a gaff handy. Surprisingly it took about 10 mins to bring in. What a rush!!! Sea conditions: windy & large swells. (Not gail force winds). White mussel used (no floater) and drag on...rod not in hand. Typical Steenbras take and run. BBBbbbbbbzzzzzzzzzzzz went the reel.